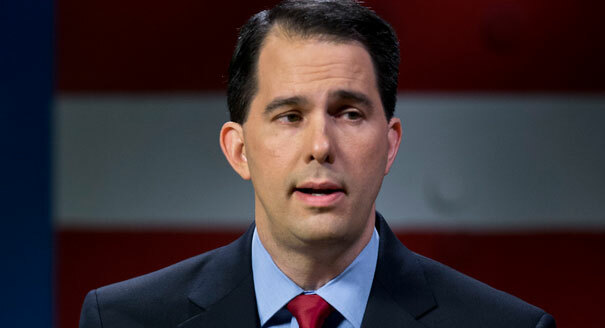 After coming into office in January of 2011 and cutting $1.6 Billion in State aid to Wisconsin’s public schools, Walker and the Republicans are proposing a tax rate cut that will take $2.3 Billion out of the revenue stream and direct it primarily to the top one percent of income earners and corporations. At the very same time, The Legislature’s Joint Finance Committee by a 12-4 Party Line Vote has elected to spend $30 million more State tax dollars to aid hospitals to cover the people left uncovered in the coming budget by Walker and his Republican dominated legislature and to decline $100 million in Federal aid that specifically targets Medicaid and Badger Care recipients for coverage. Let’s say that again: $30 million in Wisconsin State Tax Dollars Go to Corporations that Run Hospitals in Wisconsin in exchange for rejecting $100 million in Federal Medicaid and Badger Care monies. This will cut off tens of thousands of eligible poor who need these programs from those programs as well as thousands more who are on waiting lists. You say where is the vaunted Obama Affordable Health Care Act? Well, that is in part the $100 million dollars extended to the State of Wisconsin. The same thing is going on in Texas, the State with the largest percentage of poor residents who are going to be denied health care because Rick Perry there too is rejecting what is freely offered and already budgeted under the law declared constitutional by the U.S. Supreme Court a year ago. The money that should go to restoring a portion of the largest budget cut in Education for children in the State’s long history is not there—corporations and the wealthy get tax cuts instead. Even if you wanted to see the rich get richer it is bad policy. In the long term the State will be only as healthy as the skills and abilities of the millions of workers that keep it going. That is, the next generation of kids now in Wisconsin schools who are cowering under that huge $1.6 billion cut. Meanwhile,the 250, 000 new jobs Walker promised are not here yet. Wisconsin under Scott Walker has created a net gain of 36,300 jobs. Walker is now more than half way into that four year term and at this rate he will be around 75,000 new jobs instead of the quarter million promised. Worse still, Wisconsin lags behind neighboring states in the region like Illinois, Minnesota, Michigan and the national job net gains. Minnesota, Wisconsin’s twin neighbor has created 96,800 net new jobs, Michigan 146,300, Illinois 126,900 and nationally the Obama Administration has presided over 5.1 million net new jobs. Wisconsin lags behind the national net job gain rate as well. In the “in the dark of the night” department the Republican dominated State Assembly gave the minimum 24 hour notice to a sweeping election law that will remove restraints to corporate influence peddling and lobbyists in the State Capitol and put in place an even more expensive and difficult to achieve Voter ID requirement that is on its face unconstitutional. It is apparent that sponsors of the bill knew that this would be a stinker. You have notice of a new proposed bill. A hearing is held the next day and a vote is coming this Thursday and there is nothing anyone can do to stop it. Let us forget about how much better Democrats could be if they held even one part of State government as a backstop against this horrible budget and this kind of dark of night pell-mell legislating on issues and laws that are sweeping in their scope and effect. This is a distinctly non-partisan editorial piece here. What is glaringly callous and immoral for some is for all. It does not matter what political party has done what. We do know that Walker’s budget and legislative bills being proposed this session with minimum notice are immoral and further anti-democratic. It is also poor use of state tax dollars. We turn down $100 million from the Federal government Wisconsinites give tax dollars to and then spend $30 million more as a result and kick thousands off health care for the poor here. “A stunningly callous and immoral act” for the son of a Christian minister of the Holy Gospel, where rulers are enjoined by God to do justice to the poor and helpless. Struggles for Justice can only say that it is. This entry was posted in Community and Citizen Action, Education, National Affairs, The Faith Community, The State of Labor and tagged health care act, health care dollars, state tax dollars. Bookmark the permalink.